So, we made it through our first week of CSA produce – hooray! It took quite a bit of effort and a little sharing. Aside from giving away 2/3 of the arugula (I grow my own) and 1/2 the red garnet mustard greens, we ate everything else, and it wasn’t too painful. 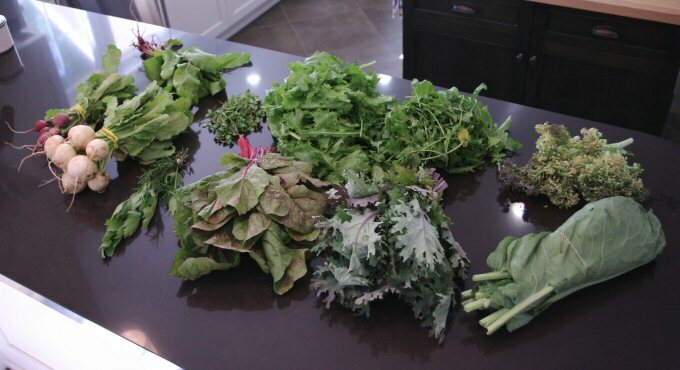 I think so far, my favorite item is the mustard greens – they are a surprise because they cook up in a purple juice. Might be good for dyeing Easter eggs! The hardest part is washing and storing everything – I can’t see anything in the fridge, there are so many vegetables in the way! Alas, we received no strawberries as originally anticipated. Perhaps the rain affected the harvest. The rain may have affected everything this week because the produce came in a bit wet, and we had to process much of it quickly to prevent further wilting. Even so, the nutritional benefits of local growing outweigh the benefits of refrigerated trucking 1500 miles across the country. Eating locally, organically and off-the-land means that sometimes your greens will be a little soft (perk them up with 10 minutes in ice water), your radishes might have holes and nothing looks out-of-the-bin perfect. Heck, the bok choi that I grow has something (probably cabbage worm) eating holes all over it, and we wash and cook it anyway. I’m lucky the bug saves me any at all – it eats the leaves and saves me the ribs. If I have time, I’ll try to post a picture – it’s funny. We’ll be sharing some of our goods this week since our garden is overflowing due to the rain. Some lucky friends will get some calls soon. This entry was posted in CSA, Local, Organic, Uncategorized and tagged CSA, Local, Organic. Bookmark the permalink. Katie knows fresh food when she sees it! Kale’s a winner!